We all judge other people cultures according to our own cultural values. This is fine when two people share the same culture. But when people from two different cultures interact, using your own culture to judge others can be disastrous. The cultures of the West and East are different—that is obvious. But most cultural problems arise when Westerners and Easterners radically misperceive those cultural differences. The infographic “Cultural Vantage Points” identifies cultural differences in six areas of everyday life. But more importantly, we also note how those cultural values seem immoral to people of the other culture. Cultural differences are easy to note. Cultural biases are much harder to sniff out, and that is the danger. Below is a short explanation of the infographic. 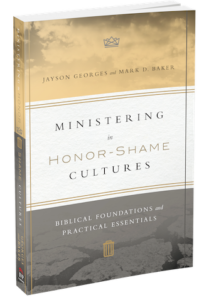 Chapter 3 of Ministering in Honor-Shame Cultures details these cultural values from a biblical vantage point. Click here to download a hi-resolution .jpg of this free infographic. Feel free to share, print, or post. A black-white version of the infographic is available here. Western culture is egalitarian. Everybody is equal, regardless of age, status, or position. We’re all buddies! But to Easterners, ignoring social distinctions is disrespectful and rude. People should “know their place” in society! Eastern culture is stratified. The older people are more respected and admired. There is a social hierarchy, a status-based pecking-order. For Westerners, this perceived oppression limits people’s freedom and personal expression. Such inequality is injustice! Westerners use time to complete a task. They “save time” and “spend time” as efficiently as possible. For Easterners, focusing exclusively on the task at hand is unkind and demeaning to others. Easterners are event-focused. People have unlimited time for relationships. For Westerners, staying 3 hours for tea is inconsiderate. People should respect my time! Westerners speak to communicate truth. They “get to the point” and “don’t beat around the bush.” For Easterners this style is rude and makes people lose face. Easterners value harmony in communication. You avoid saying “no” because that doing so would disrupt relationships. For Westerners, focusing on face instead of facts seems like deception and lying. Westerners try to be financially independent. We raise our kids not to be dependent, because that indicates a moral deficiency. For Easterners, an unwillingness to share resources comes across as stingy and even immoral. Easterners share resources through patron-client networks. The wealthy provide security and stability to people in exchange for loyalty and praise. For Westerners, these “financial friendships” seem like corruption. Westerners view food as an unavoidable nuisance, an interruption of our day. So we eat “fast-food” as we drive to a meeting or work at our desk. For Easterners, this food-efficiency neglects rituals of ethnic identity, like having special foods or eating with family. Easterners value hospitality. They share food generously, making sure to honor their guests. For Westerners, the expectations of lavish feasts are ostentatious and onerous. Westerners regulate social behavior with guilt. The government creates and enforces laws. And children are socialized so their conscience feels guilty for breaking rules. For Eastern cultures, people who disregard social decencies have no sense of shame (i.e., shameless), even if they are 100% innocent before the law. Eastern cultures regulate behavior with shame. Relationships and public opinions determine what is right and wrong. Children are taught to bring honor to their family or tribe. For Western cultures, this contextual ethic appears lawless—people ignore the laws and do whatever they want. Do you have an example of misjudging the other culture, or having your actions been misjudged by the other culture? Did this infographic prompt an ah-ha moment for you? Please share below in the reply section. Click here to download a hi-resolution .jpg of this free infographic. Feel free to share, print, or post. What’s doubly beautiful about that infographic is that it represents a gulf between the Eastern text and Western exegesis. It’s easy to assume the Bible itself shares our western values and metaphysical assumptions when it actually lives in that Eastern world! Yeah, wouldn’t it be great if courses in Hermeneutics involved reflection on these cultural biases/assumptions! 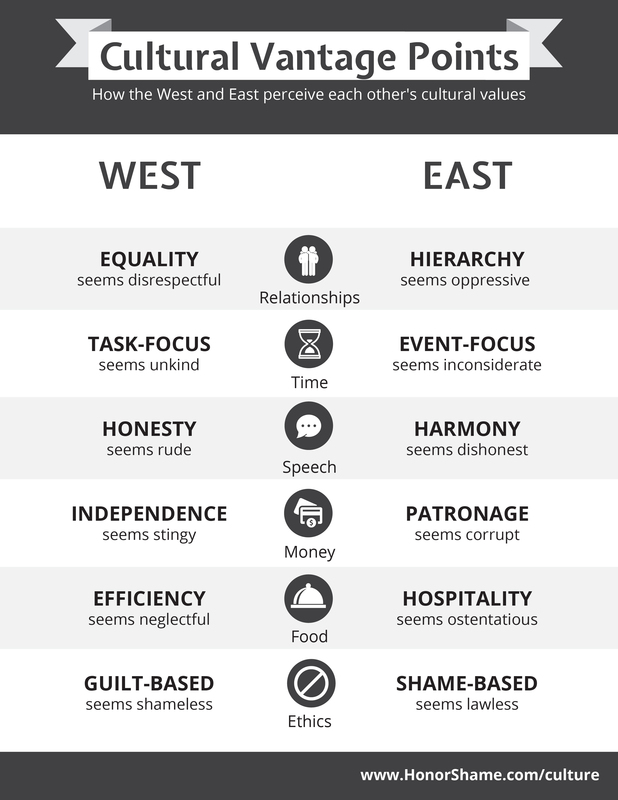 A nice generalized summary of East/West differences. In some places the cultures are quite mixed so the landscape is even more complex and challenging to navigate. IMO, it shows why the skills associated with deep listening and building relationships are so critical. The US is moving quickly away from a Guilt Based Value Structure into a Shame Based Culture. I wonder if asking ourselves how developing a better cross cultural understanding can help us here as well as overseas. Hi Gary, I love your posts, and concur. Blessings on your ministry, which has so deeply impacted mine. I’m hoping to use the insights from this graphic/article/post to enhance my D.Intercultural Studies diss. writing for Biola. Good insights for here & abroad! Growing up in rural, conservative America, and having studied a lot of issues regarding truth and logic, right and wrong, etc., I look at this and ask myself: “Which is biblically right?” I also wonder if there’s a way that these ideas and cultural biases can be harmonized within the Body of Christ? This is very helpful and I will point my students to it. An example from Thailand: I returned to the school I manage unexpectedly one afternoon to find two teachers leaving early. I shamed them by asking where they were going 🙁 I should have just entered the school since they knew I knew they were leaving early. That would have given them the opportunity to come and explain themselves the next day without hurting our relationship. Would the teachers have come and explained their reason for leaving early or would they just continue to come and go as they saw fit, without weighing what would be best for their families and the students and the culture of the school? How did they honor you as a leader by not taking permission to leave work early? Thank you in advance for your insight. I love, love, love the content of this infographic! My only suggestion would be to use different colors. Green on red is very hard to read, and someone who is colorblind wouldn’t be able to read it at all. But the actual points are poignant and so good. I’ve been teaching this for years, and am glad to see others doing it as well. I work internationally and had to learn this the hard way, but it certainly is valuable knowledge. There’s also another, a fear based worldview that is found primarily amongst primitive people. Fear of what can’t be controlled – like weather – motivates sacrifices, rituals, curses and other animist beliefs. It makes for a distrustful culture prone to violence and quick retribution for perceived wrongs. I call them the three ancestral worldviews, and base them scripturally in Genesis. Excellent resource! 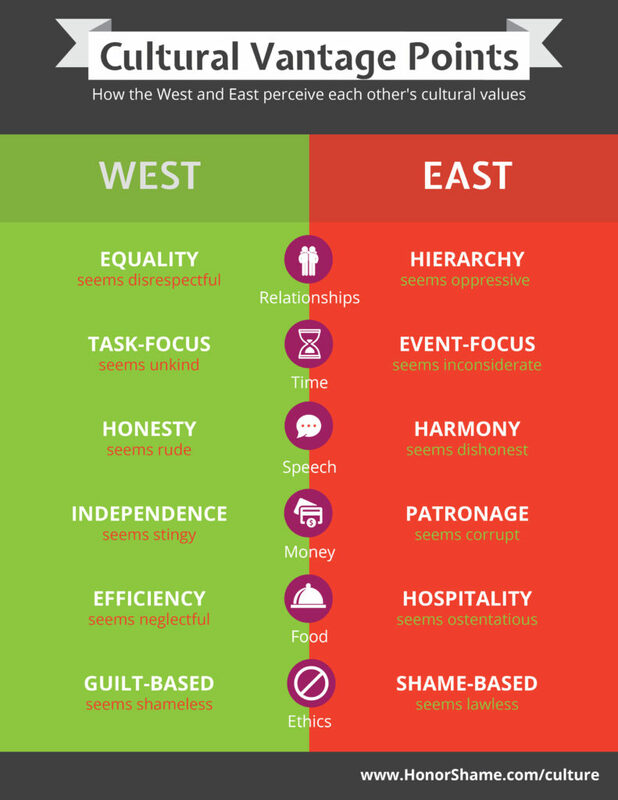 1 Pings/Trackbacks for "INFOGRAPHIC: How Cultures Clash"